My cat is very destructive. Inspired by a ramen dinner had at restaurant Daikaya in Washington D.C.
Who Wants to Be a Mama's Boy? Illustration for the short story "Who Wants to Be a Mama's Boy?" on Narratively. Inspired by this profile of Bryan Stevenson. Inspired by the novel, The Dispossessed by Ursula K. Le Guin. Cover art for the Salk Lake City Weekly story about the 2016 legislature. Inspired by the podcast, Reply All. Original illustration. 2015. In honor of Black Friday, Cyber Monday, and everything in between. Inspired by the novel Radio Iris by Anne-Marie Kinney. Inspired by AOID, the latest album by the post-country, indie rock band Ratboys. Autoptic, Minneapolis' Premier Comic and Independent Print Festival, is returning August 19th 2018. Outside of First Ave. Nightclub. Minneapolis, MN. My poster for the 2016 Artcrank poster show. Client: Kellogg Insight, Northwestern University. Inspired by The Shallows by Nicholas Carr. The Job of The Wasp is the third novel I'd read by Colin Winnette. This most recent book, published by Soft Skull Press, is from the perspective of a boy who finds himself in an orphanage and then a swarm of murderous insanity. 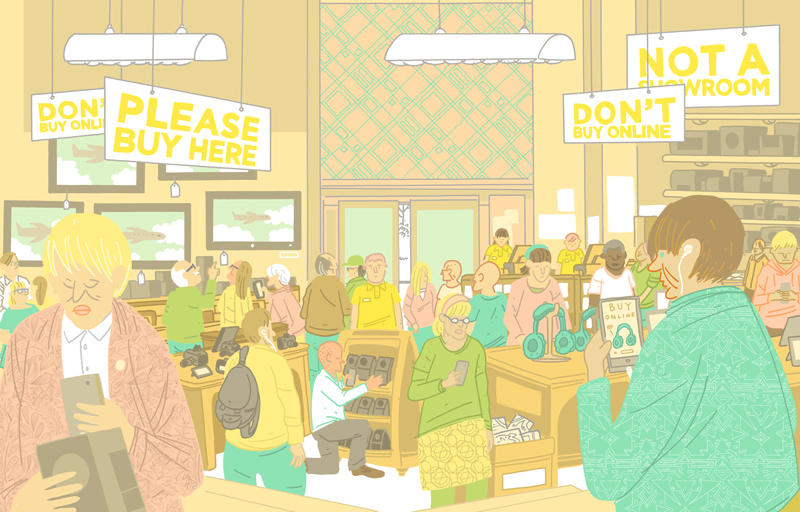 Animated version of an illustration done for this Narratively Story. Finally, I got around to seeing The Office. The trick, I guess, was finding the time for all 9 seasons. Like a great sitcom, it applies the comic-strip "variations on a theme" to perfection. Doesn't hurt that Steve Carrell is reliably goofy.